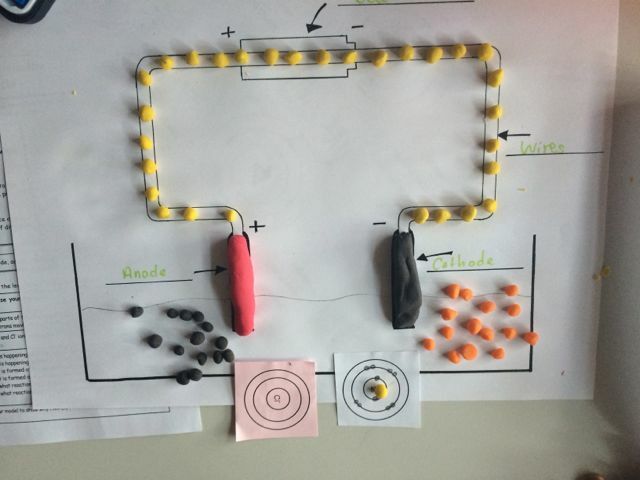 Key concept: electrolysis is the splitting apart of an ionic compound into its elements using an electric current. Before we can start , the ions must be able to move – so melt or dissolve in water. The negative ions move to the anode where they lose their electrons to form the element. Positive ions move to the cathode, where they gain electrons to form the element. Electrons move though the wires. In this way, electrons are ripped from the negative ions (oxidation) and move into the circuit to replace the electrons given to the positive ions (reduction) – the power source is the electron pump. Misconceptions [scientific idea]: NaCl(aq) exists as NaCl particles in solution [we get sodium and chloride ions, along with hydrogen and hydroxide ions]; electrons move in the electrolyte [ions move]. Students are amazed that by simply passing electricity through molten NaCl you can produce the metal sodium and the toxic gas chlorine – neither of which resemble the white solid you started with. Electrolysis of molten lead bromide works well in the classroom – use a fume cupboard. Click here to go to the page on the extraction of metals. An excellent summary of electrolysis of molten compounds by Jim Clark.